National Urban Fellows, one of the country's oldest leadership development organizations, announced today the findings of Diversity Counts: Racial and Ethnic Diversity among Public Service Leadership, the first comprehensive review of representation in government, philanthropy, and non-profit organizations. 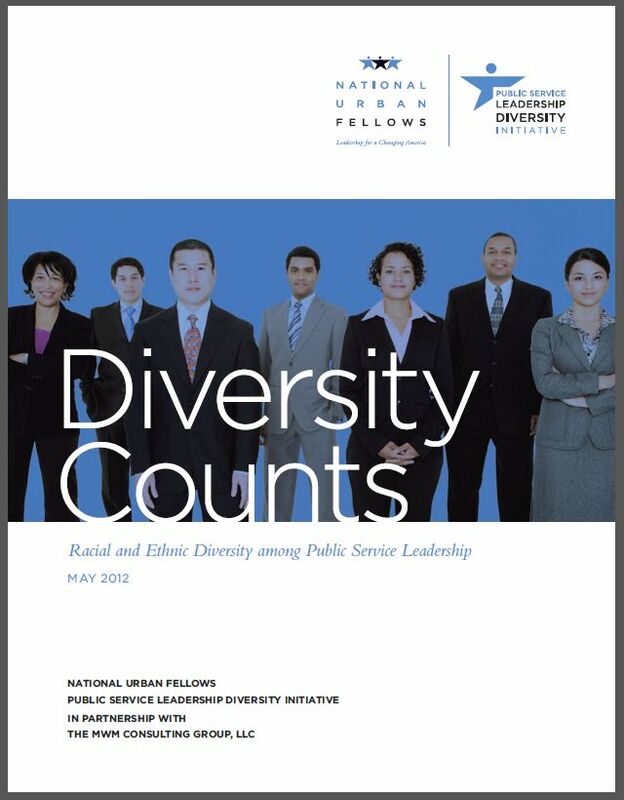 The report is published by National Urban Fellows' Public Service Leadership Diversity Initiative (PSLDI), and presents a current snapshot of the racial and ethnic diversity of leadership in the public service sector. Diversity Counts reveals the continuing dilemma of the under-representation of people of color in public service leadership, while offering that leadership diversity remains both an opportunity and a challenge for public service institutions. The opportunity is for top decision-makers in public service to adopt system-wide inclusionary practices and the challenge is to expand opportunities for new diverse perspectives in leadership. "We believe that diverse and inclusive leadership can more effectively address the complex social issues that confront our nation," says Paula Gavin, National Urban Fellows President. "When the disparities in public service leadership diversity are addressed, the public service sector will have greater capacity and access to people and communities of color. She concluded by saying, "It is our hope that Diversity Counts, will ignite a national dialogue, and serve as a catalyst for change among groups including members of Congress, state and local elected officials and board of directors for nonprofit and philanthropic organizations. Through the actions of the PSLDI, we will find the human capital that will bring new leadership perspectives, skills and ideas to bear toward confronting social policy dilemmas." Congressman Michael Honda of California agrees saying, "I want to thank the National Urban Fellows for publishing the Diversity Counts report, which provides a critical, long over-due assessment of diversity and representation in the public sector. In order to face the challenges ahead, we as a nation must address the shortage of qualified leaders of color in the nonprofit, philanthropic and government sectors. As the representative of California's 15th District, one of the most diverse districts in the nation, I know the importance of empowering leaders of diverse backgrounds to solve the most pressing social, political, economic, health and environmental problems." The publication shows that for congressional representation, diversity among the combined 535 House and Senate members only about 16 percent are people of color. Specifically, 44 (8 percent) are African American, 27 (5 percent) are Latino/Latina, 10 (2 percent) are Asian Pacific American, and 1 (less than 1 percent) is Native American. Also according to the data, staffs of U.S. Representatives are under-represented in key positions: only 13 percent of chiefs of staff are people of color; approximately 13 percent of House legislative directors are people of color; and only about 22 percent of senior legislative aides and legislatives aides are people of color. The report illustrates that state and local governments don't fair much better. In state government among the 50 governors of the United States, 92 percent are of White, non-Hispanic heritage, and that only 13 of the 50 states and the District of Columbia have a chief diversity officer on record. Among the five most diverse states, people of color are under-represented in state legislatures, including the state house of representatives/assembly and the state senate. In county and local governments sixty-one percent of our nation's 18 most diverse counties have an executive who is identified as a person of color. In the majority of the nation's most diverse cities, there is an under-representation of people of color on city councils, in comparison with their percentage of the general population. In two cities, San Francisco, California, and San Antonio, Texas, the percentage of people of color on the city council, 71 percent and 90 percent, respectively, exceeds the percentage of people of color in the general population, 58 percent and 73 percent, respectively. A review of diversity in the nonprofit sector also indicates that leaders of color lag behind in executive positions. For nonprofit boards and executive leadership positions, data indicate that the vast majority (88 percent) of nonprofit executives are of White, non-Hispanic heritage, and that only 12 percent are people of color. In 2010, 86 percent of the members of nonprofit boards of directors were White, non-Hispanic, and only 14 percent were people of color. The goal of the Public Service Leadership Diversity Initiative, founded by National Urban Fellows in 2010, is not only to achieve proportional representation in the public service sector by building a pipeline of talented, highly skilled candidates of color, but to dismantle the barriers to inclusion and to support the public's recognition that diversity in leadership leads to organizational excellence and results. With a dual emphasis on individuals and systems, and through research, communications, stakeholder mobilization, and action, the Public Service Leadership Diversity Initiative will seek out partners to develop a new, inclusive paradigm of public service leadership.